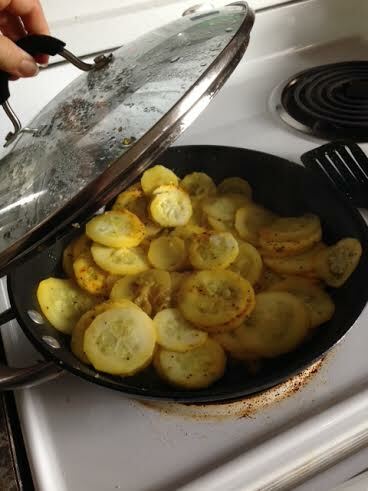 Sauteing squash, from a friend’s garden, in a little bit of coconut oil and seasoned with turmeric and Montreal Steak Seasoning. I’m pretty experienced with food prepping because I’ve been doing it now for about seven years. 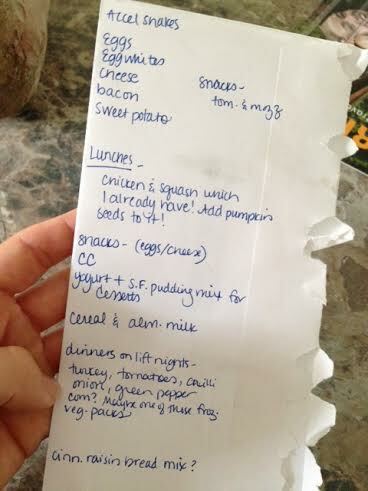 I always grocery shop on the weekend–typically Saturday–and I usually prep my food on Sundays. 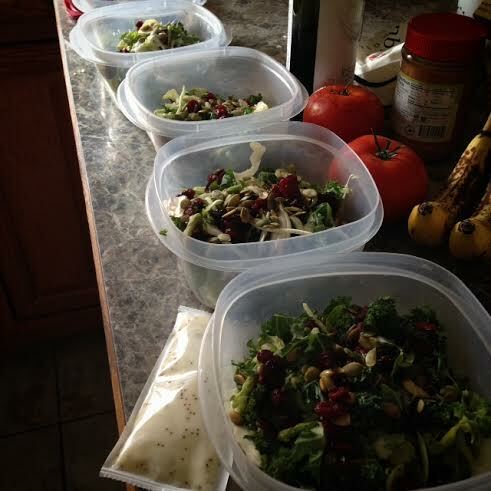 I’ve gone through several stages of food prep too. The “all-organic” food prep, the “Paleo” food prep, the “spend 8-hours-in-the-kitchen” food prep, and the “ain’t-got-time-for-that-so-throw-it-in-the-microwave” food prep. Let’s face it, food prep can be extremely boring. because I feel like most of my food is pretty boring. I eat ground turkey every week. Sure, I throw in a plate of scallops and asparagus every now and then, but that’s usually because Erik is cooking something awesome for dinner and I get to have some too. My food picks don’t change very often so I’ve never felt like I needed to write much on the thirty different ways to use ground turkey. My low carb chili: ground turkey, cauliflower, peppers, onions, tomatoes, a little chicken broth, spices. But recently, Erik and I have been doing a lot of reading on finances, creating budgets, living life debt free, and learning how to plan and save for the future. I know, I’ve never felt so adult-ish. My dad would be so proud. And one of the things I’ve learned about myself is that I usually spend WAY too much money on food. On our current budget, I spend $50 each week on my food. I pay for everything in cash, so I can’t go over my limit. You have no idea how many things I would typically pick up and throw into my cart just “because.” This also keeps me from eating out, grabbing food on the run, cooking more than one pack of bacon in a week, or just randomly swinging by the store for some Justin’s Organic Peanut Butter Cups when I’m craving something sweet. I also know that when I’m out of food, I can’t just go to the store again. I eat what’s in my fridge, cabinet, freezer, etc., until it’s time to plan for the next week. These are my three must-haves: coconut oil–an essential “good” fat, turmeric–an inflammation and cancer fighting spice, and Montreal Steak Seasoning–which just makes EVERYTHING taste better. I don’t know what your current budget may be or even if you have one, but I would set a limit if I were you. If you are cooking or prepping for a family, set a limit for your family, or maybe a limit for each person. Erik’s weekly budget is $75. He’s a guy, he eats more, and he also makes more money than I do, so that plays a factor as well. Luckily, he also buys and prepares his own food for the week so I don’t have to worry about it. Once you have your budget, plan your meals. This week, I scrambled out my thoughts on the back of an envelope. 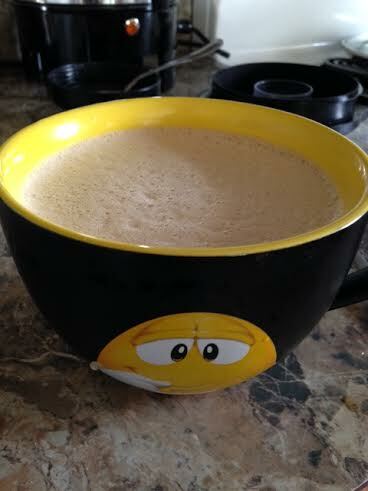 Upon Waking: Accelerator shake made from coffee, coconut oil, and whey protein. My famous accelerator shake, inspired from DH Kiefer’s Carb Backloading 1.0. 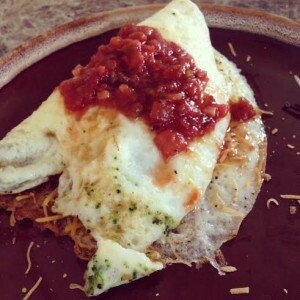 Breakfast: 1 egg with 1/2 c egg whites, sprinkle of 2% cheddar cheese and a couple spoon fulls of organic salsa. I might cook my eggs in a tsp of ghee or Smart Balance. I also might add a slice or two of bacon and/or maybe 1/2 sweet potato. (This is also sometimes my dinner. I really love this meal.) Important note about breakfast: Many of my readers know that there are new discoveries showing that breakfast is NOT the most important meal of the day! Gasp! 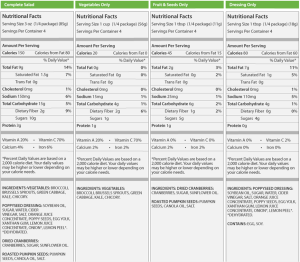 This is why I drink my accelerator shake first, and a couple hours later–if I need it–I eat a meal centered around protein and fat, avoiding insulin-spiking carbs (in which I save for peri-workout.) 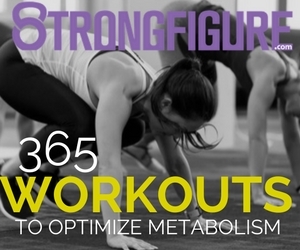 Doing this actually helps burn more fat and preserve muscle mass! Here, an egg, egg whites, cheese, salsa, and some broccoli I found in the freezer. Lunch: Chicken breasts with sauteed squash in coconut oil and a spoon full of pumpkin seeds. Probably my most boring meals of the day but that’s ok because this is what I take to work and then I have no other options than to eat this or go hungry! Pre-Workout: I might eat a couple more eggs with cheese if really hungry. 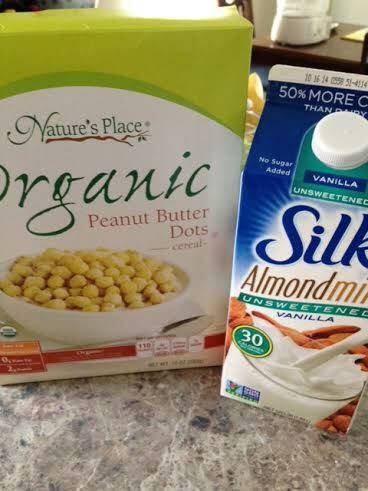 Post-Workout: My favorite thing right now–cereal, almond milk, Dymatize ISO cake batter protein powder. I typically only have the cereal if it’s a heavy lift day. 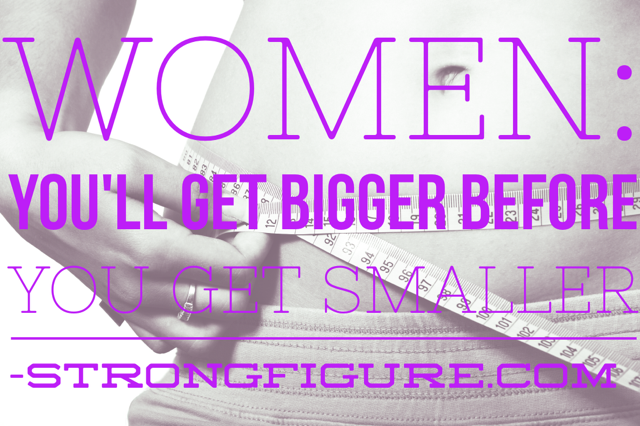 If not, just the protein powder and a piece of fruit or smaller carb serving. A fantastic post lifting meal! Don’t forget to add the protein powder! My chili and cornbread. 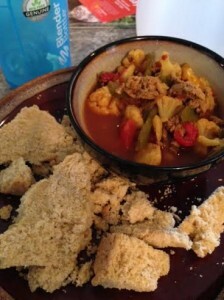 Yeah, the cornbread fell apart a bit. I don’t care though, I freaking LOVE cornbread! Erik first told me about eating frozen grapes. I never thought this would work but you have no idea how easy it is to walk by the freezer and grab a small handful. Apparently, 26 of them is 100 calories. I’ve never eaten more than 5-6 at a time. You know what I used to walk by and grab out of the fridge? Hundreds of calories worth of peanut butter. Way better choice here. Extras: I sometimes keep gum on hand if I’m at work and feeling the need to snack on “snack-type” foods hanging around. I also really try to drink as much water as possible each day, and I always keep packs or cans of tuna (and sometimes the pouches of baby food–especially sweet potatoes) on standby just in case! I always check to see if these items are on sale! To be fair, I already had a handful of ingredients I needed for this week that I had either previously bought (the can of diced tomatoes and the gluten free cornbread mix) or had left over from the week before (coffee, whey protein, coconut oil, pumpkin seeds, string cheese, salsa, and grapes). 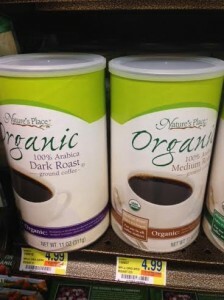 I used to shop at our local Martin’s/Giant and even the local Food Co-Op because of the awesome organic/gluten-free/whole-foods/locally grown and raised availability. But these stores are really pricey. And I’ve read a lot about organic foods and how there are really only a few “musts” when it comes to buying those. For example, I read that if you had to choose between organic produce and free-range/organically raised meats, go meat over produce. I’ve also read several times that if you peel a fruit or veggie, don’t worry about buying organic. So being on a budget, these are the battles I don’t fight. My local Food Lion actually has a great organic and locally grown foods section and is much cheaper than the competitors. Unless there’s something I can’t get at Food Lion (like nitrite/nitrate free bacon) that’s where I get the bulk of my foods. 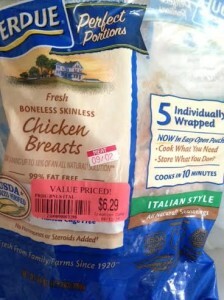 And what I love about shopping there is that they always have the BEST prices on meat. 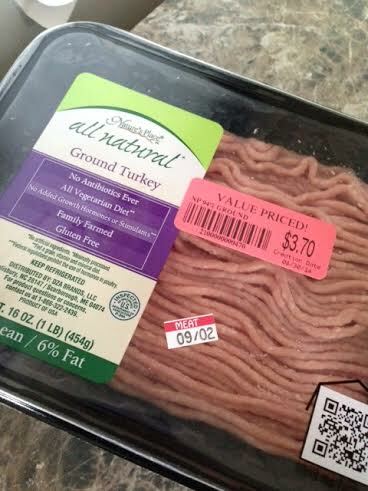 Compared to other stores, I can get free range/no steroids/no hormones meat and almost every single time, I can find it marked down and ready to sell! 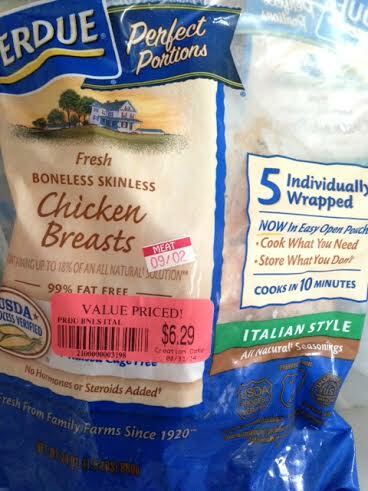 I don’t even really like chicken breasts but I keep finding them marked down and I feel like I can’t afford NOT to buy them! Typically, I will buy my meat for the week and then buy extra and freeze it because I always find it marked down every time I go in. Right now, I’ve got 5 frozen chicken breasts in the freezer for next week waiting on me. That’s going to save me at least $6 from next week’s budget! And did I mention what Erik and I do every time we have money left over? We save it for a fun date night at the end of the week or the end of the month. Last month we had two dinners out! And those dinners seemed extra special because we knew we were still saving money for our future and working towards our goals without being too spend-thrifty. It’s actually a lot of fun! I only spent $46 at the store for the whole week! So yesterday I went to Food Lion and for $46, I bought chicken breasts, ground turkey, two bags of frozen vegetables, four tomatoes, a box of lemon pudding mix, two containers of yogurt (I really wanted more than two but didn’t), two packs of gelatin, almond milk, cereal (one box–I really wanted two), one carton of 18 eggs, one carton of egg whites, one pack of bacon (I didn’t get the “heatlhy” kind this time), one pack of 2% shredded cheddar cheese, one sweet potaoto, and a bag of carrots (I just realized I forgot to cook my carrots). Side note: I love cooking carrots until they’re soft and then tossing them in coconut oil and cinnamon. Instead of snacking on crap foods whenever I get the urge to eat something, I can just eat a couple carrots and this really helps. 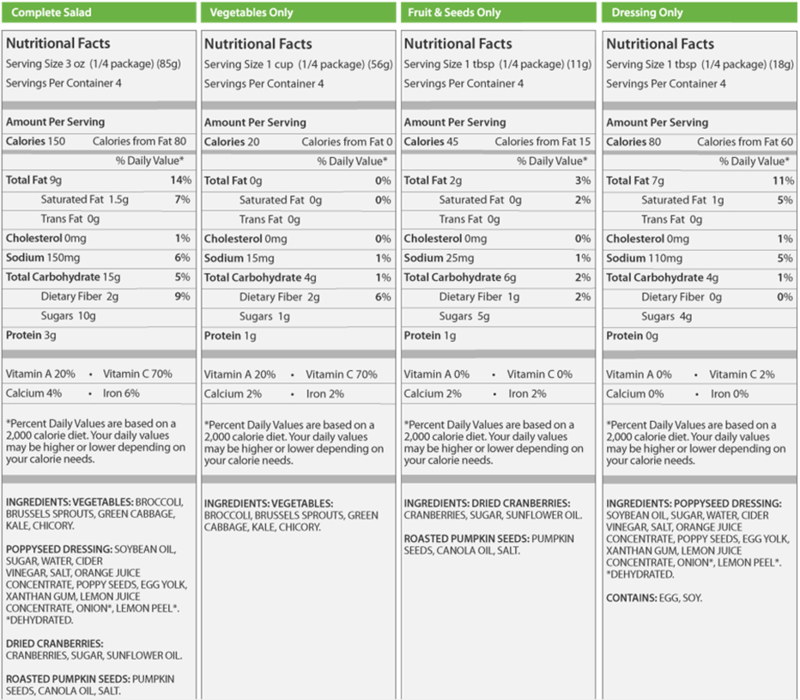 I’m your classic “snack-eater.” Having a lot of healthy options around really help me! This cart of food, combined with some other items in the fridge, freezer, and pantry, will make up all my meals for the entire week and I’ll probably have leftovers going into next week as well. The best part of it all is that all my foods are healthy–for the most part–and they fit my needs for lifting weight, building muscle, and even burning fat. 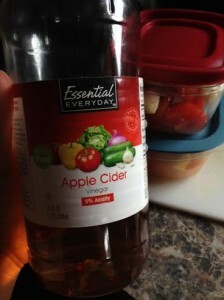 I add apple cider vinegar to my tomatoes or salads, etc., because it is SO good for you in several different ways, especially with aiding digestion! I buy almost all my veggies frozen. 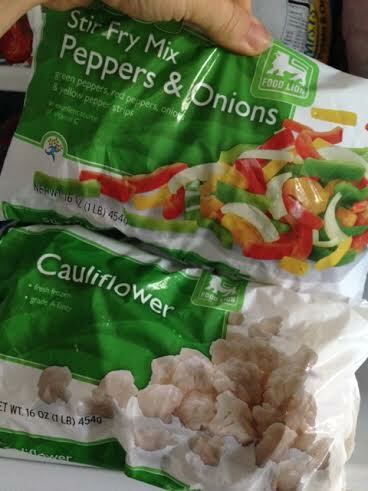 It saves money, I usually buy the store brand, and frozen veggies are just as healthy (if not healthier) than fresh! Peppers make any dish flavorful, and cauliflower really helps fill me up! 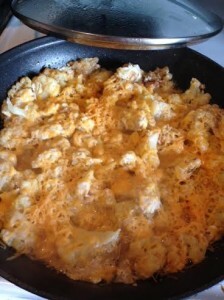 One of my favorite dishes: cauliflower, cheese, and eggs. It’s like a hashbrown casserole without the potatoes! Add bacon and it’s even better! This also easily makes a good 4-5 servings. Rice is really cheap. 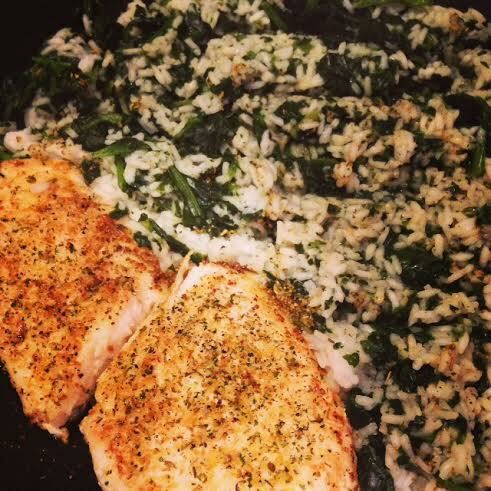 Here, I have hog fish caught and given to me by a friend, and I cooked some white rice and frozen spinach together, adding my favorite seasonings to the mix. Note: I usually buy organic spinach because it’s on the list of highly toxic sprayed foods! Possibly my best ever creation: the closest thing to cake batter you’ll ever eat! 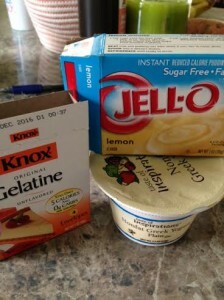 One cup of greek yogurt with a half a package of sugar free/fat free lemon pudding mix, a few TBS of your choice milk product, mix, refrigerate for an hour (or eat it right away, doesn’t really matter), and this is my favorite semi-healthy dessert! I’ve recently started adding a packet of gelatin to the mix (or to my post workout meals) to get the 8 extra grams of protein AND the added collagen repair. I bet you could also use banana pudding mix and add sliced bananas…Oh my goodness! Give yourself a budget and don’t spend a penny over. Food planning isn’t difficult. It just takes a little time, experiments, trial and error. You’ve got to allow yourself a few hours to prep your food and over time, you’ll need less time. I went from 8 hour food-prep to 2. If you can’t set aside this time, it will never happen. I refuse to make homemade salads from scratch. That takes FOREVER. I used to spend HOURS chopping and dicing to make the perfect salad. 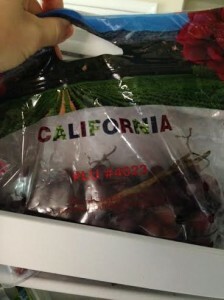 This mix comes from Costco, and one $5 bag contains enough for SIX salads! This is a super blend with 8 super food ingredients. I added steak to top them each with protein. Ground turkey, frozen steamable bags of vegetables, and a “good” fat like avocado, nuts, seeds, or coconut oil will make the perfect dish…no matter how you cook it. The best way I can help you is by answering your questions. 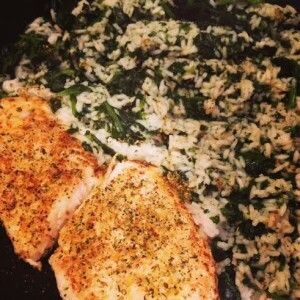 What are your food prep questions? 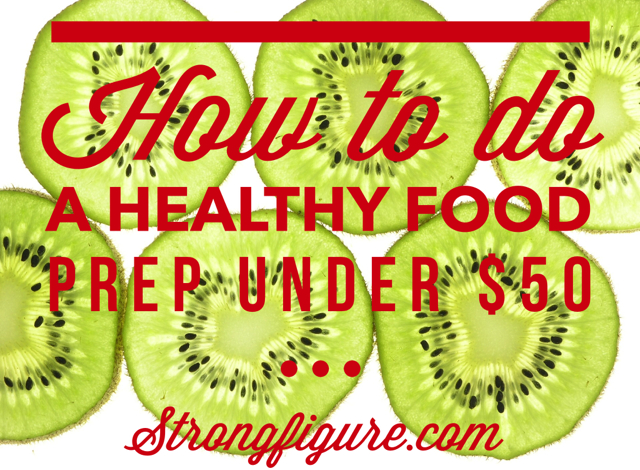 Eating healthy on a budget questions? Ask them in the comments section below and I’ll respond with my answers. You can TOTALLY do this! My friend Emily emailed me to ask what is the name of the Costco salad I referenced, what I use as a dressing, and also how I make my cauliflower/egg hash above. I wanted to answer here in case anyone had the same question. Eat Smart’s new Gourmet Selections Vegetable Salad Kits are restaurant-inspired salads that are nutritious AND packed with great taste. The Sweet Kale Salad creates a harmony between the bitter kale and the sweetness of cranberries and poppyseed dressing. This unique blend of vegetables is topped with roasted pumpkin seeds for a zesty crunch. The Sweet Kale Salad is nutrient-dense, containing seven superfoods and offers delicious flavors that will keep you coming back for more. 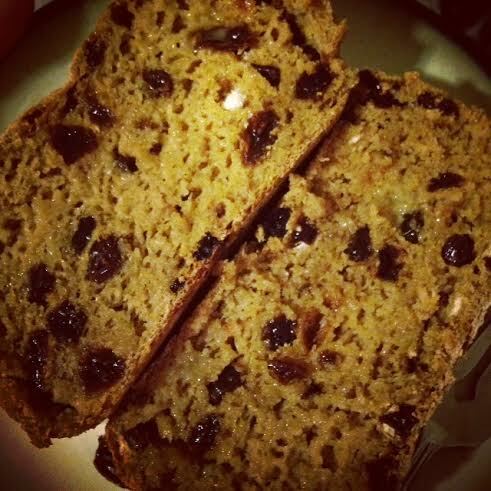 GLUTEN FREE and vegetarian friendly! So yes, the dressing actually comes with the salad and I used it! I’m pretty famous for not using salad dressings and making my own because I’ve never ever EVER found a salad dressing I like or agree with as far as ingredients are concerned. This dressing isn’t perfect but it’s relatively low in sugar so I said “heck with making my own, I’ll just use this.” And it was really really good! If you’re concerned with cutting out sugar (shouldn’t we all be?) I would just use oil and vinegar. I typically use extra virgin olive oil (sometimes flax oil), and I also use either red wine vinegar, balsamic, or apple cider vinegar. 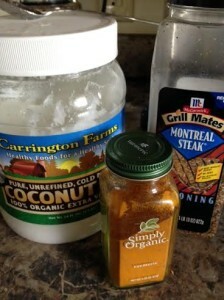 When I make my own dressing (Erik’s favorite!) I use about a quarter cup olive oil, a cup of red wine vinegar, a TBS (or two?) of dijon mustard, salt, pepper, and garlic. It’s really good! (And I totally estimated these amounts.) Also, I honestly debated NOT including the dried cranberries when I ate this salad because they contain so much sugar. However, they looked so good that I decided again, “heck with it!” The label on the salad says that the bag equals four servings but I easily turned it into six because I added protein to the salad. I’m a big eater and I felt full. One serving, per the label and including the cranberries, pumpkin seeds, and dressing, is 150 calories, 9 grams fat, 15 grams carbs, 2 grams fiber, 10 grams sugar and 3 grams protein. If you eat JUST the salad (no dressing, no cranberries, no seeds — though I would totally keep the seeds — pumpkin seeds are so good for you but that’s a whole new post) then one serving is 20 calories, 0 fat, 2 carbs, 2 fiber, 1 g sugar, 1 g protein. This is super easy and even more easy to modify depending on your needs. On Sundays I love having bacon. 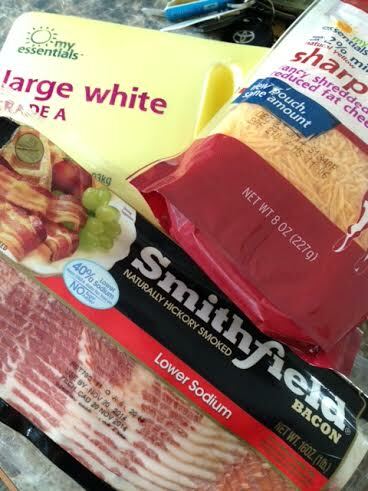 Well, every day I love bacon, but it’s kind of a tradition in the house to get up and cook it on Sunday. So I usually cook a few slices of bacon and then in the meantime, chop up a head of cauliflower. You could save time and probably money if you used frozen cauliflower (thawed before cooking), but I like fresh for this dish. When I remove the bacon from the pan, I add the cauliflower to the leftover bacon grease. I keep the heat around medium and cook the cauliflower til it’s really tender. A fork should be able to mash it. I then add 1-2 whole eggs, and a generous pour of egg whites (maybe a cup?). I stir the eggs in really well and cook that until the eggs are cooked all the way. I put a thin layer of 2% cheese on top, place the lid on the pan, keep everything on med-low until the cheese melts. Crumble up the bacon and then add it back to the mix before serving. This is SO good. You could make it healthier by opting out of bacon…maybe using ghee to took the cauliflower in (clarified butter)….or even use mozzarella. But in my house, Sunday traditions are hard to break. Em, I hope this helps!! I love this article! 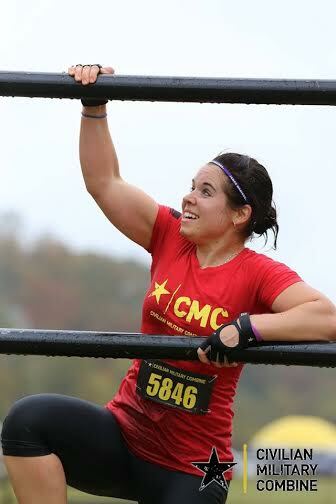 It is competing with 18 reasons to love/hate Crossfit for my favorite article! 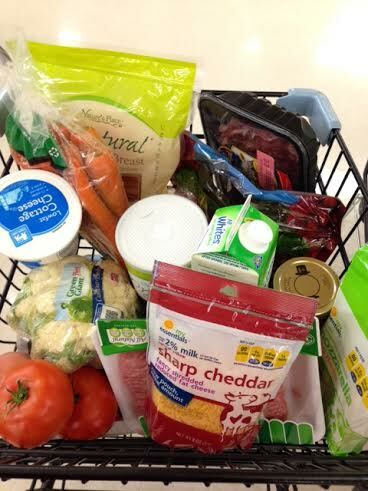 It is so impressive that you can have such a healthy and balanced diet on a $50/week budget!! I know that I easily spend $150-200 EACH WEEK for me and Sam. But so many things go bad or I just don’t feel like eating what’s in the fridge!! I love that you are so dedicated to know you’re not going to go grab lunch/dinner out and you just eat what is in your fridge. I really need to crack down and make a budget. I will definetly use this article and share it with friends! Thank you Steph! You’re very welcome Reagan!! Ps–thanks for that hog fish! 😉 I’m glad you like the article–I hope it helps a lot of people!! Good luck with your budget–I think it’s much easier than most people think. Most people buy too much food and splurge on unneeded items. 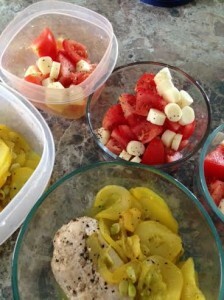 And dividing up food into five or seven containers really helps portion things out. I used to buy way too much stuff and still find myself holding an item in the store and then putting it back BC I know I just don’t need it that week. Sometimes it’s little things too….like do I need 7 containers of yogurt or do I really need to eat that every day? Or even making a jar of salsa last two weeks instead of one. Little things add up! Good luck! AWESOME post Stephanie 🙂 and KUDOS to you for prepping on a budget, I am completely oblivious with money, (#sorrynotsorry, I still don’t feel like an adult) BUT I do try and get good deals/buy in bulk/buy frozen veggies/only buy what’s on my list, so I’m not that bad! As for the frozen grapes, GENIUS IDEA, I DO IT TOO, cause I can’t not walk by the kitchen and grab something, and this is something cold and sweet, my fave! 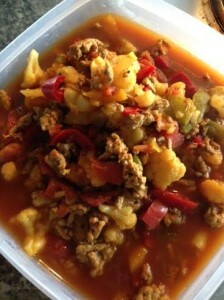 I need to eat more ground turkey, I am a chicken breast girl for the win, eat it every week! Where is the best place to get coconut oil? Deb, the best place is Costco. They have a very large container of it for about $18. I wouldn’t buy the Spectrum brand–it’s usually the cheaper brand you see–it isn’t quite as good as the rest. All the other brands typically run $20+ for a small jar. Costco’s brand is top quality and much more affordable. Both Erik and I use it every single day and it lasts us a very long time. Let me know if you don’t have a Costco membership and I’ll pick some up for you the next time I go! I suppose this is more a “general nutrition” question — but I’ve been trying to food prep too (to reduce the number of eating out nights James and I have). My struggle is trying to find balance in protein/carbs/fats and when to eat them. Should I be eating more veggies and fruit on my workout day or my off day? Same with meats etc. I’ve been trying am protein (eggs) fruit/veggie/cheese lunch and something meat wise for dinner. But it dawned on me maybe I’m not eating enough calories and or proteins to build muscles. Hey Jess! You have probably one of the most common questions that I’ve come across. I’m actually working on a post for next week that will go into this a bit further…keep your eyes open for a post on workout and nutrition tips. 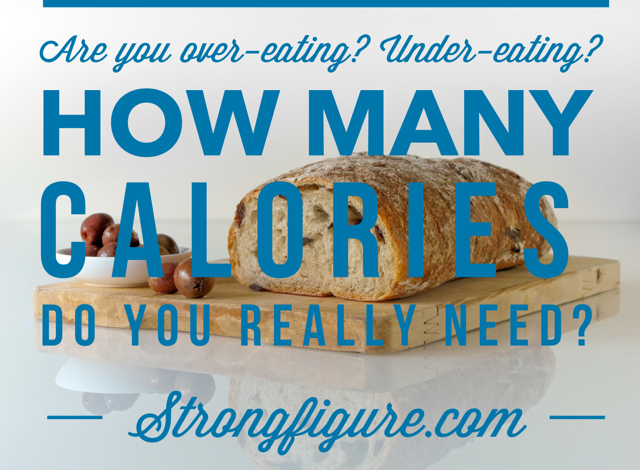 But you’re right, it sounds like you might not be eating enough! Here’s the thing: you need to eat protein at every meal meal, no matter what. Focus on proteins like chicken, turkey, fish, eggs/egg whites (the yolk is really good for you! ), etc. Don’t be scared of beef, dairy, pork..they all have their place and are quite good for you though they seem to be “taboo” by many. The simplest way to look at nutrition, especially for fat loss and muscle building is this: Every meal should include protein, veggies, and the good for you fats. Chicken and broccoli cooked in coconut oil is the perfect example of a meal. (I would count cheese, btw, as a fat. Most cheese has more fat grams than protein grams, so I would only include small amounts of cheese every now and then as a fat source.) If you need a visual, think of food this way: take your dinner plate and divide it up into thirds: one third for veggies, one third for protein, and one third for healthy fats. Some people suggest the veggie portion to be larger and the fat portion smaller, but I like a little more fat for energy purposes. I especially love avocados, nuts, seeds, or cooking my food in coconut oil. Next, you want to eat differently around your workout. The best time to eat carbs (sweet potatoes, fruit, grains, etc.) is around your workout. It’s recommended for muscle building that you have some carbs and protein about an hour before you workout, you can even sip on protein during your workout, and then after your workout, you want protein and carbs again. 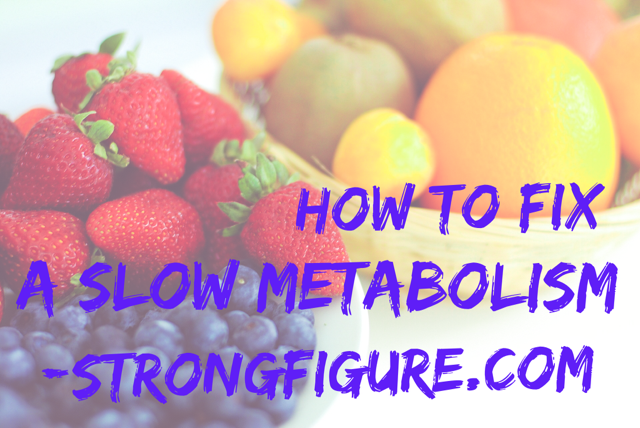 You actually want to AVOID eating any fat for about 2 hours after your workout b/c it will slow down the rate that the protein gets back to your muscles! So as you can see, WHEN you eat foods can be more important than what you’re eating. 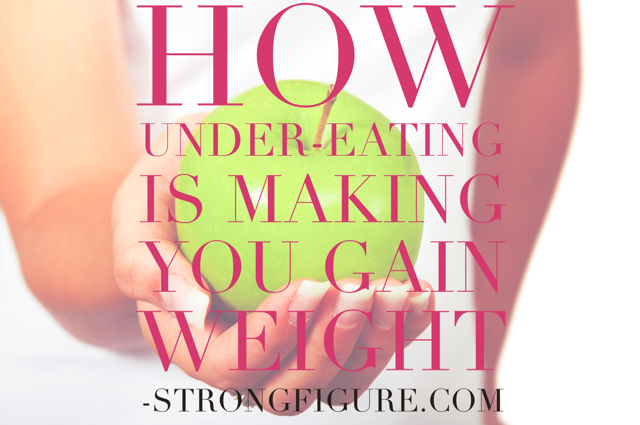 So as long as you’re getting enough protein (you can take in as much as your body weight in grams–i.e. if you weigh 130 you can eat 130 g protein each day, some people actually aim for more), plenty of veggies, the good for you fats, and then carbs around your workout, you’ll be fine. Also, if you only eat three meals a day, there’s technically nothing wrong with that if you don’t feel like you’re hungry, but adding a pre or post workout shake/snack can be beneficial to your muscle-building needs. Also, if you get hungry late at night, cottage cheese has always been a great go-to snack for me. The type of protein it is–casein–is a slow digesting protein and will keep you feeling satisfied as well as fuel those muscles. 😉 I hope this helps…I feel like I rambled all over the place so if it’s confusing, let me know! This can be very detailed but I tried to keep it simple! This is a wonderful article! Great information. At some point, can you do a write up of how/what you should eat when you do a morning workout? Mainly pre-workout and post workout! Gretchen, be on the lookout for this next week!! I’ve got one in the works right now! You make me smile and chuckle, THANK YOU! Hey Izzy, Sorry I’m seeing this late! The shake I have is so simple and so yummy!! It’s hot coffee (about a cup) with 1 scoop vanilla or chocolate protein powder, 1 tsp coconut oil, and 1 tbs heavy cream. Blend it all up!! I have found that I actually prefer chocolate whey over vanilla and I’ve also found that the higher quality wheys blend better. My favorite is Dymatize ISO 100. Hope you love it as much as I do!